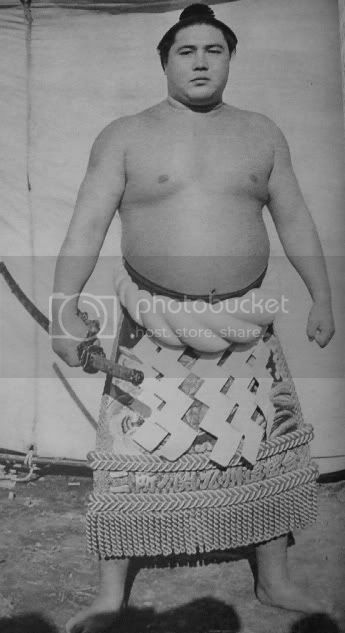 You're sure it's not Chiyotenzan? 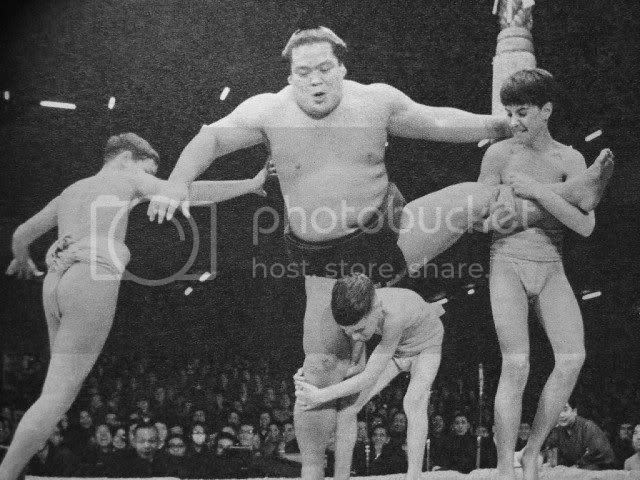 Would make more sense in that context. 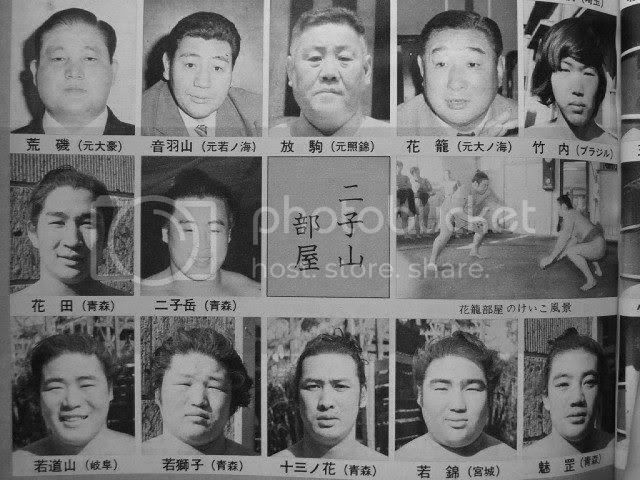 if i find more in the future i'll add them. 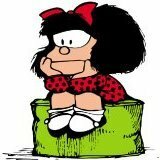 Aaaaaaaaaaaaaaa great Petros!!!!! 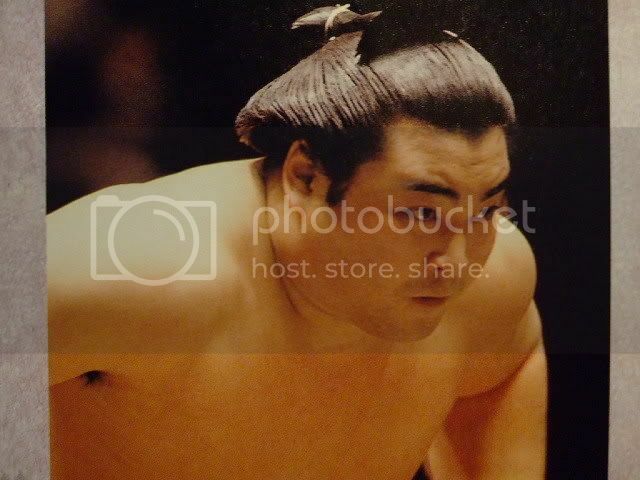 :-O (Pulling hair...) , thanks very much !!!! 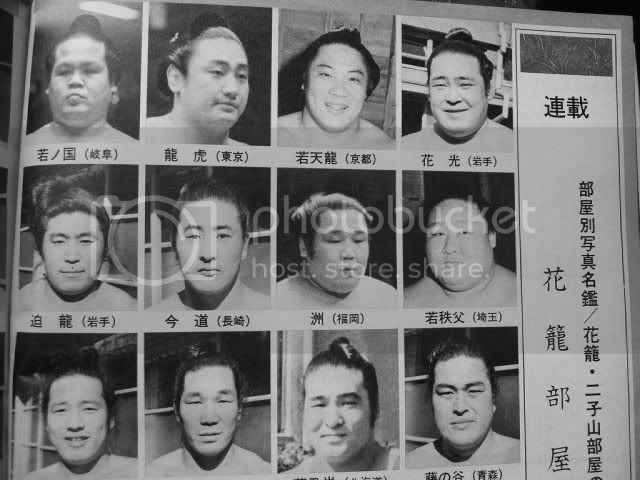 I think it was a one-day tournament with some oyakata also entering. 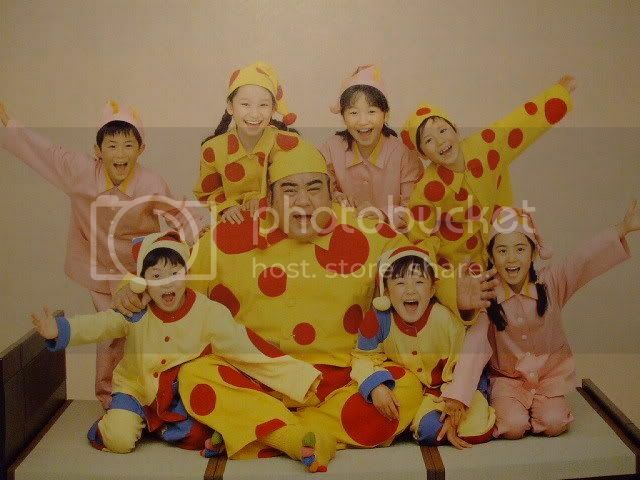 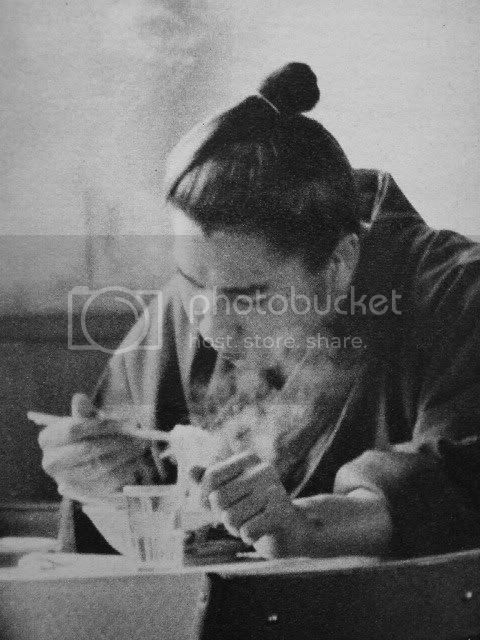 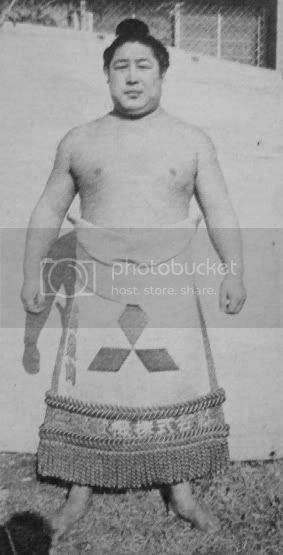 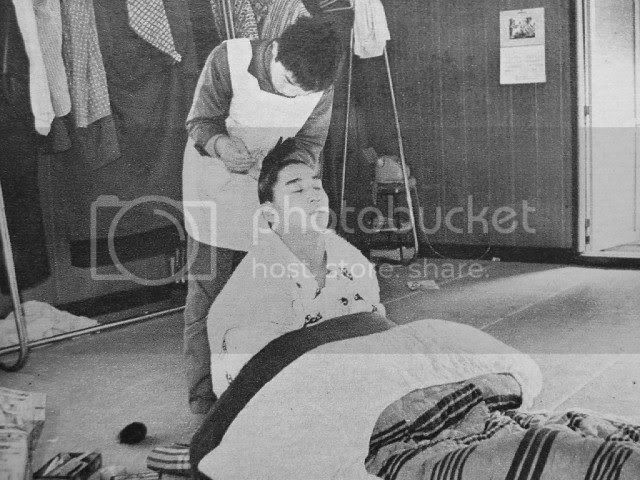 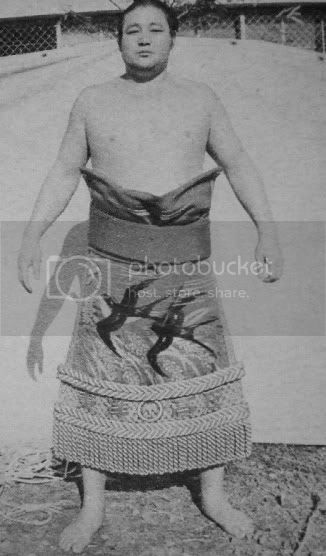 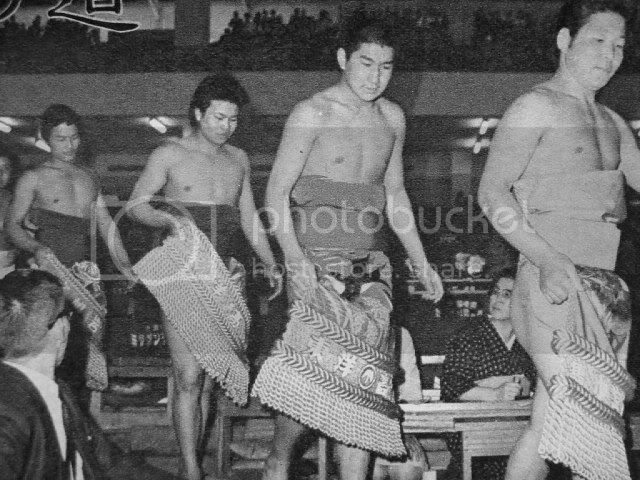 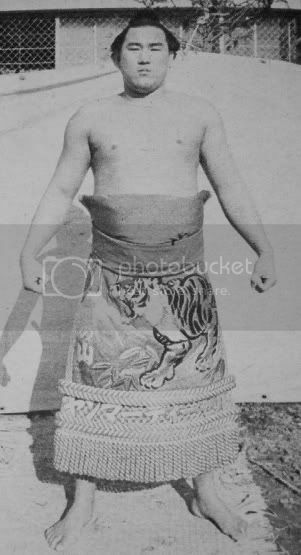 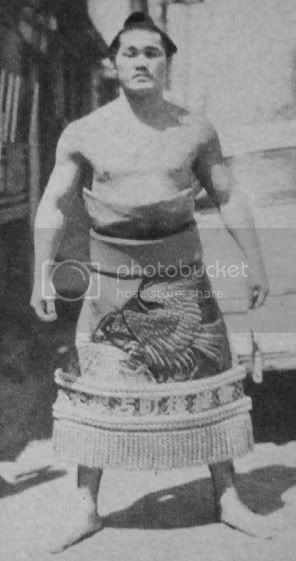 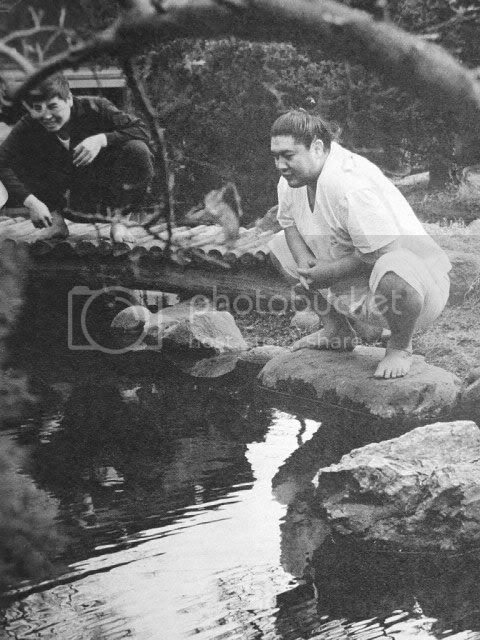 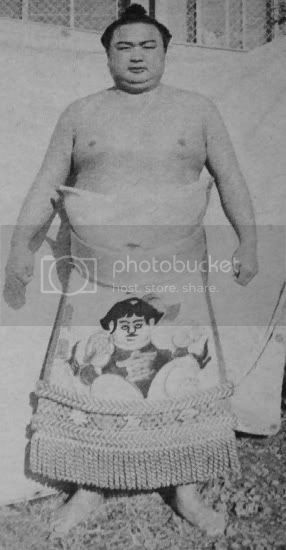 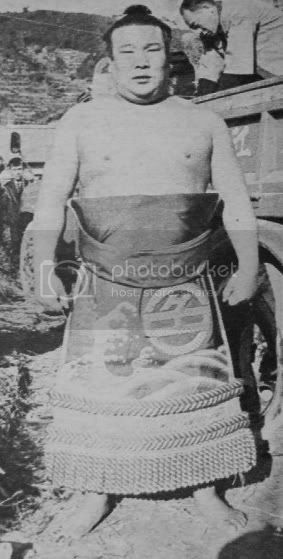 The caption says it was Nishikdo oyakata (former Otayama) doing the yumitori. 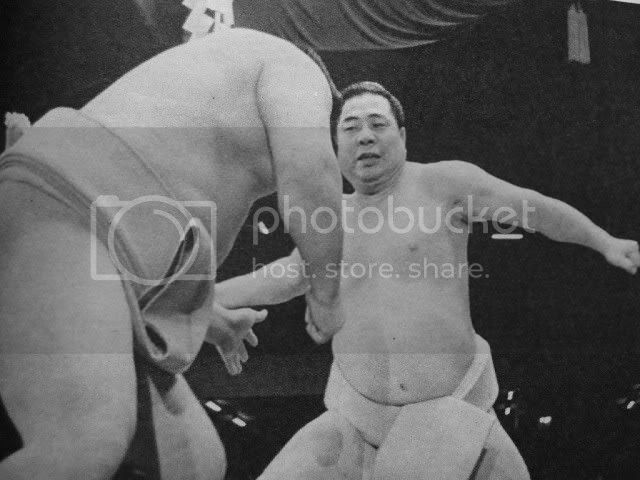 And Wakanohana is called Futagoyama oyakata in the other caption, against Hanada. 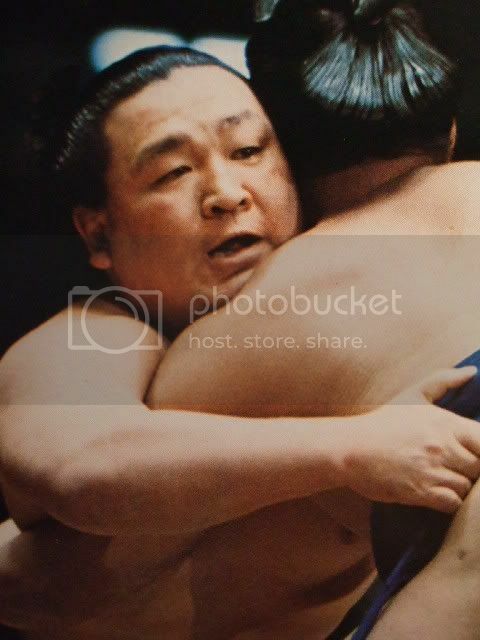 and let's wrap this up for today (or not?) 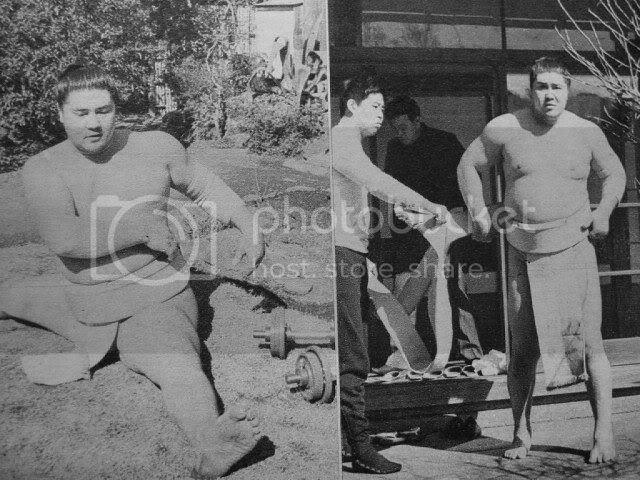 with some small pics for Doitsuyama. 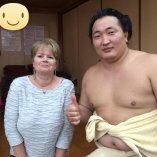 Yes, he's the one on the left. 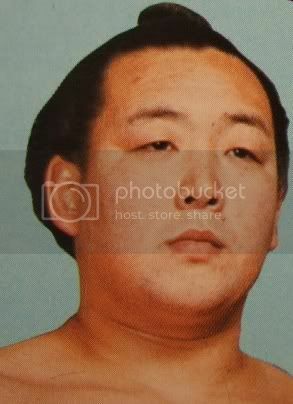 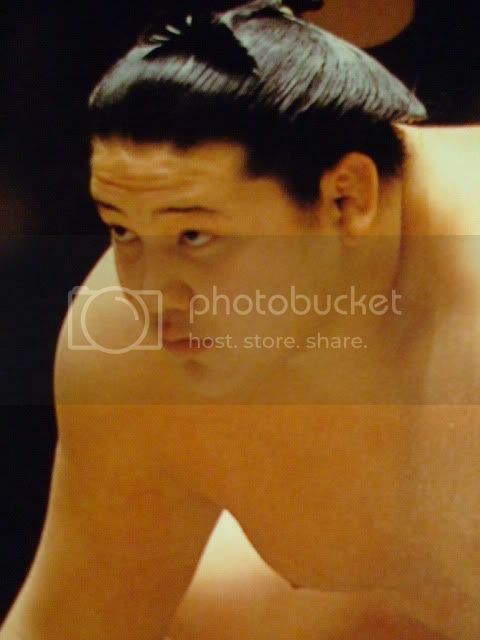 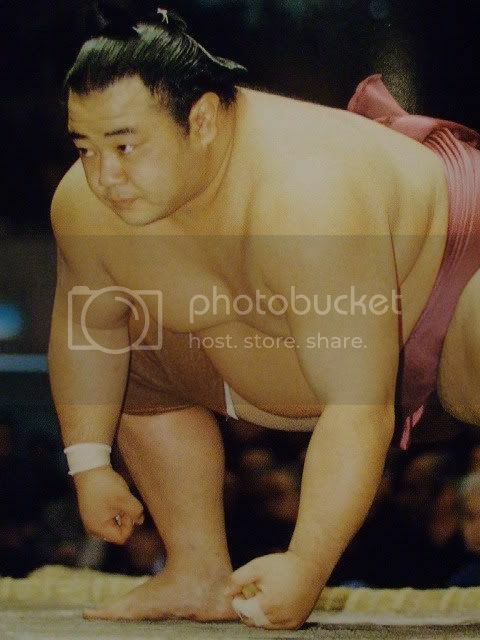 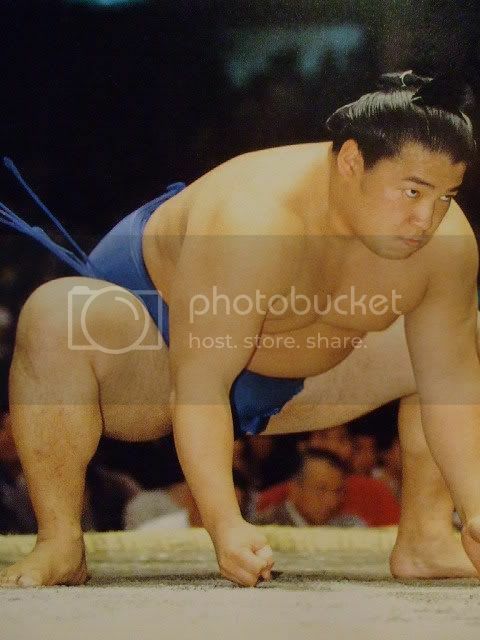 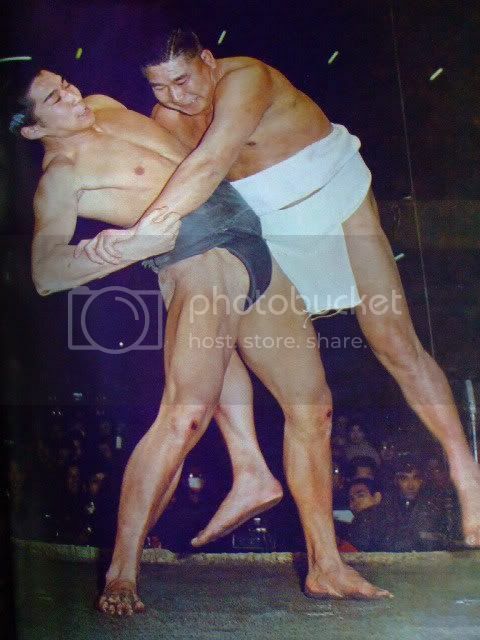 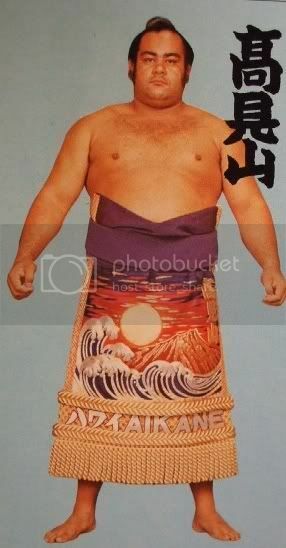 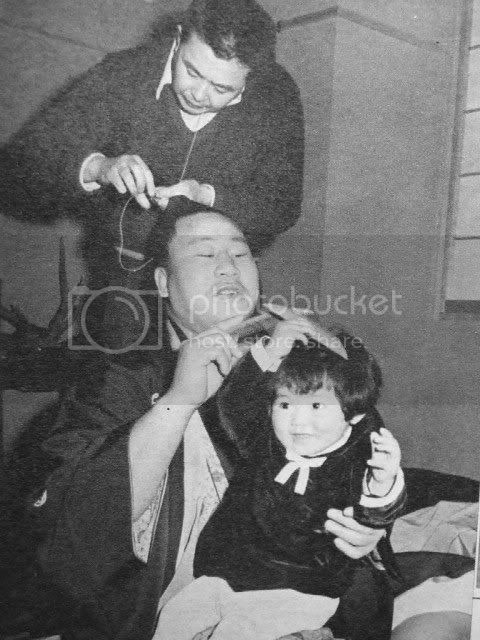 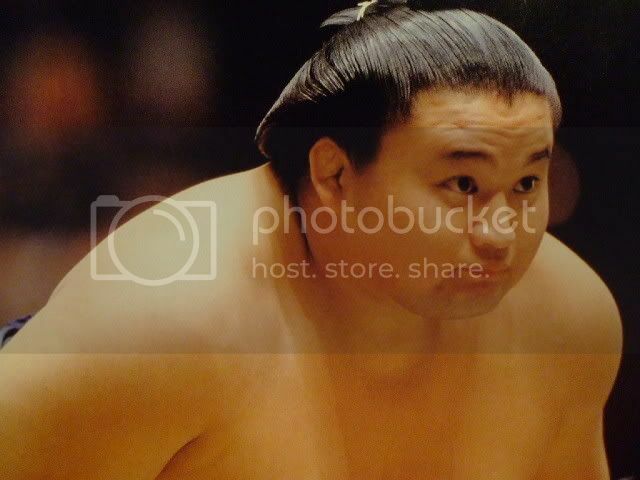 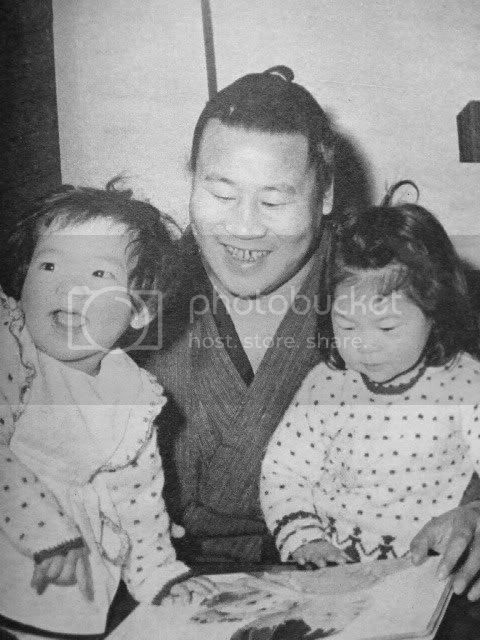 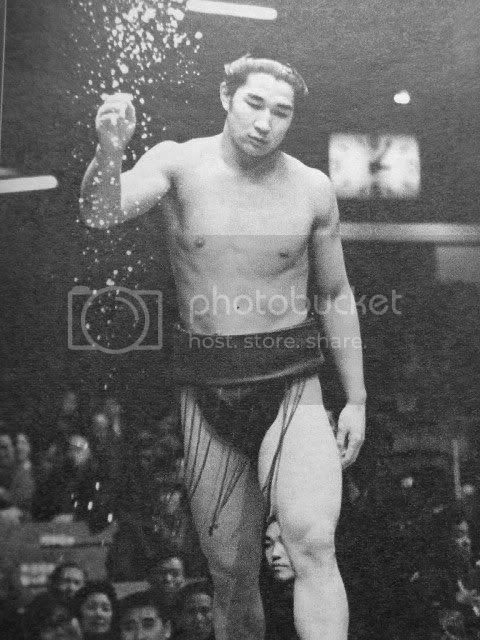 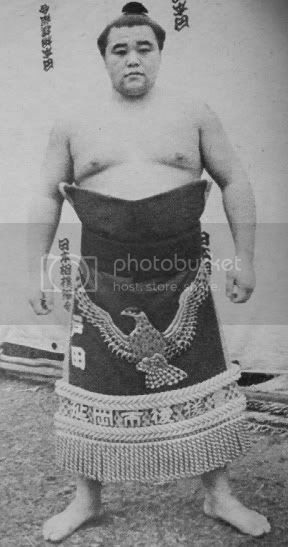 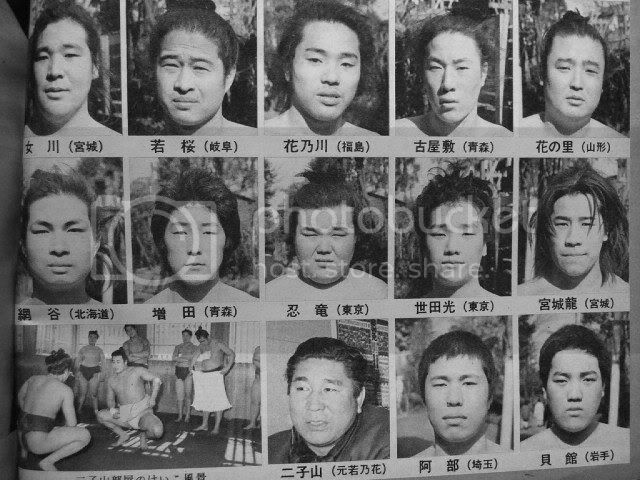 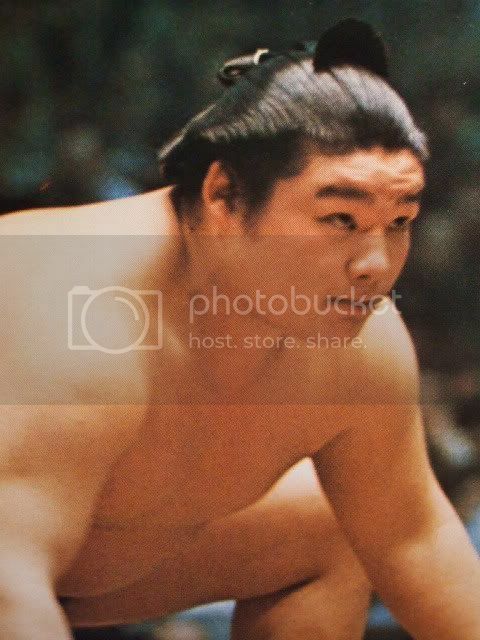 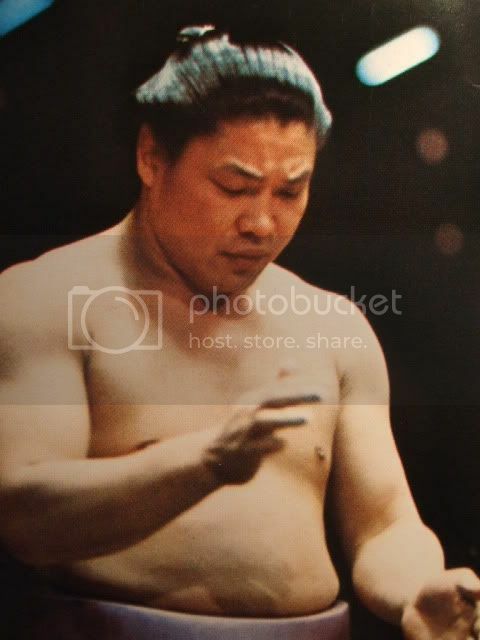 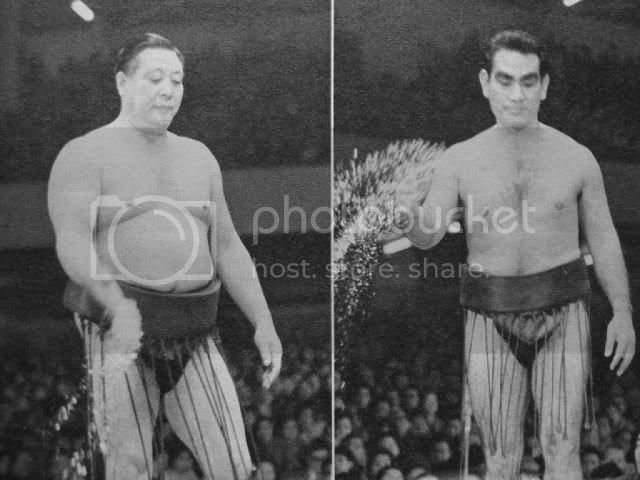 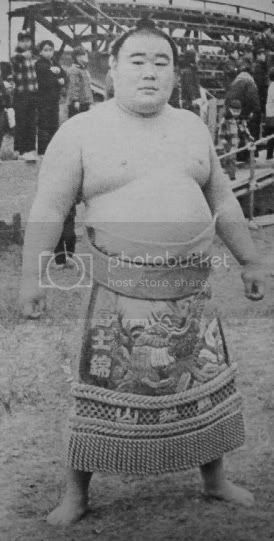 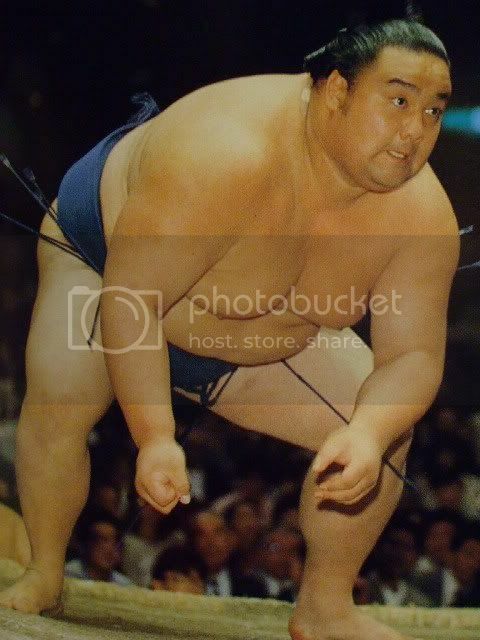 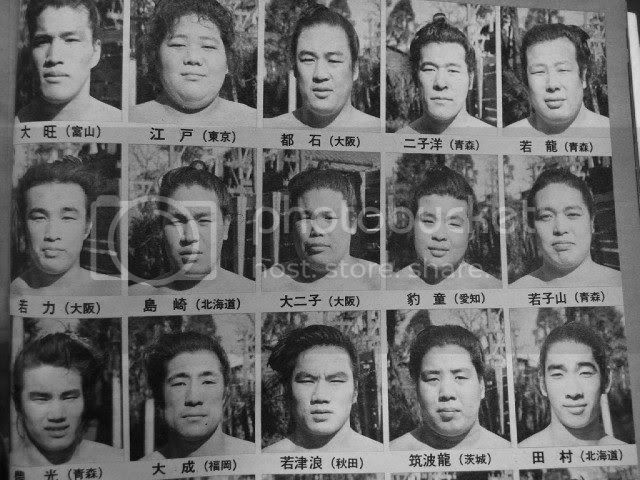 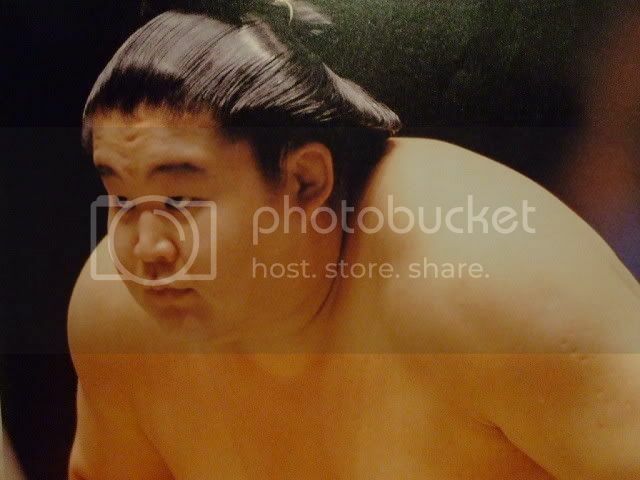 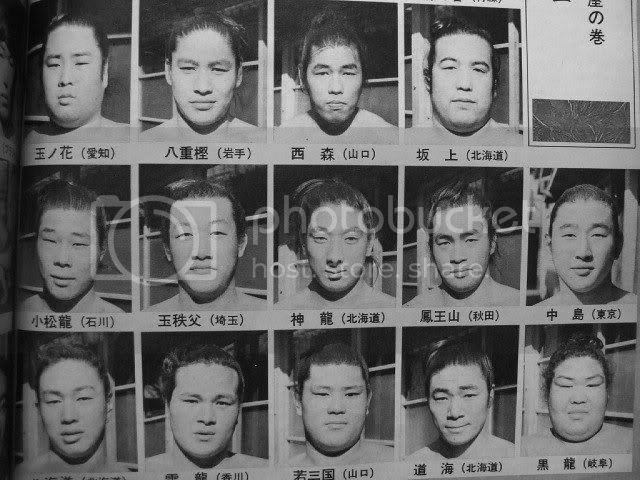 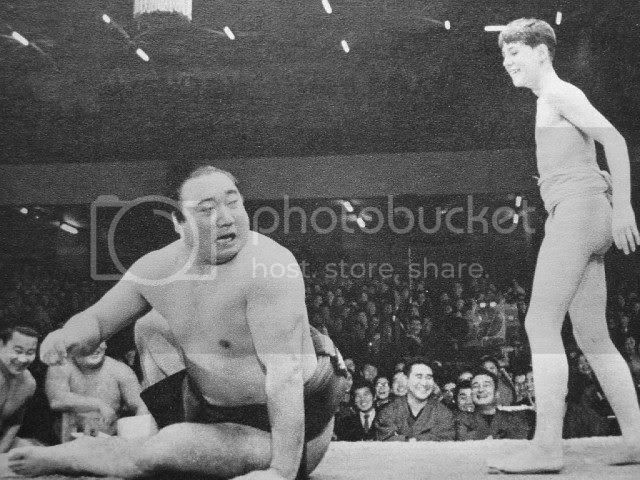 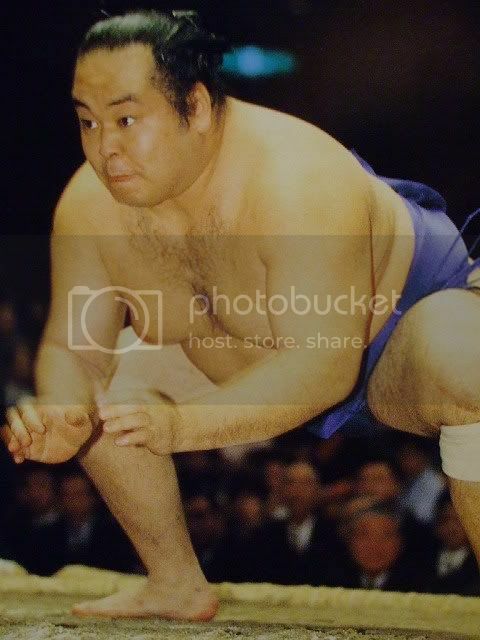 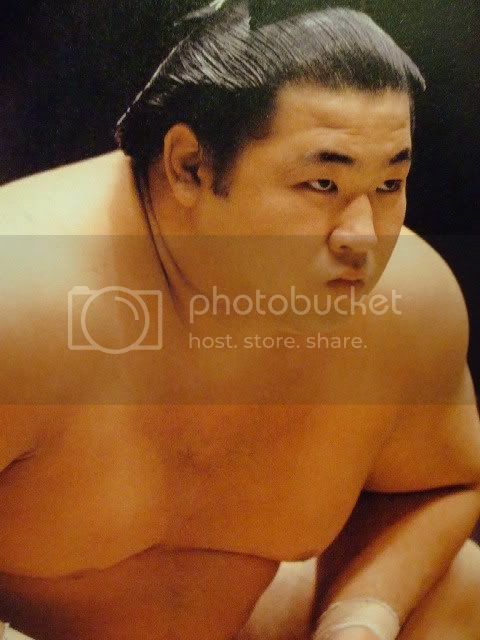 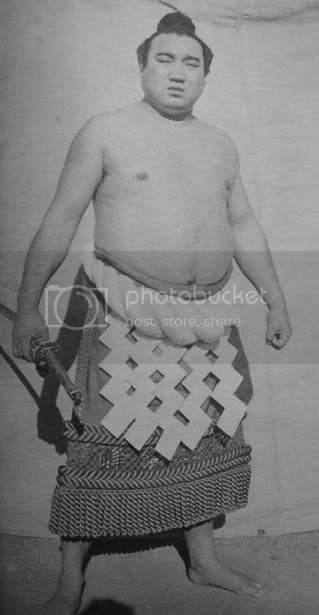 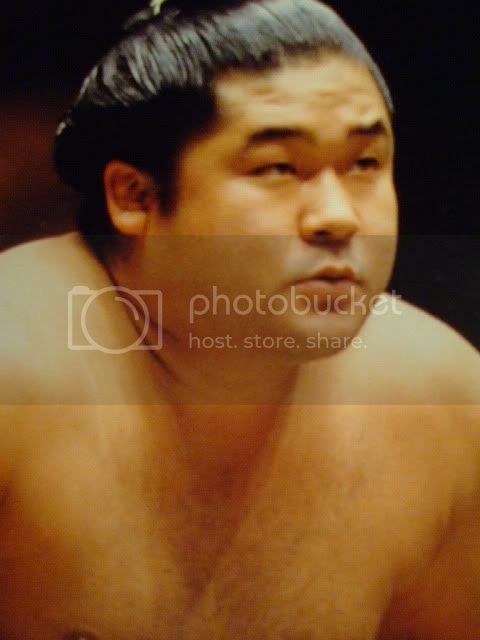 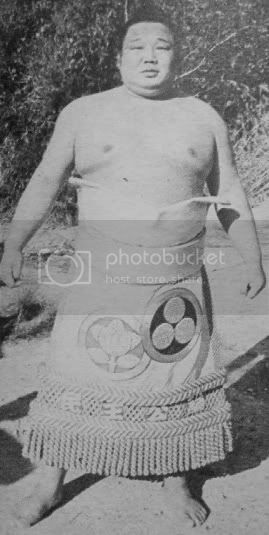 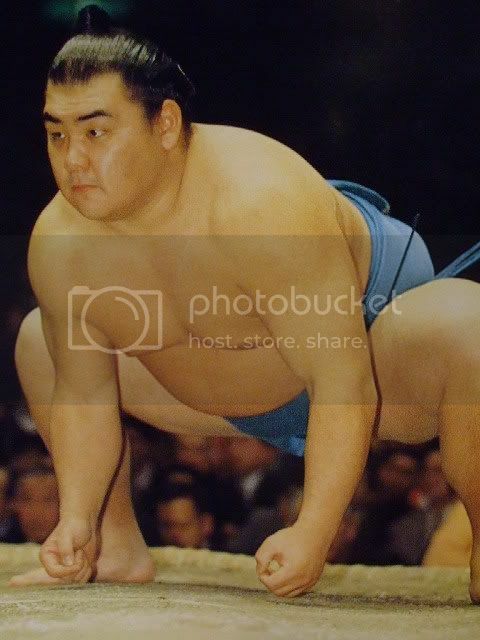 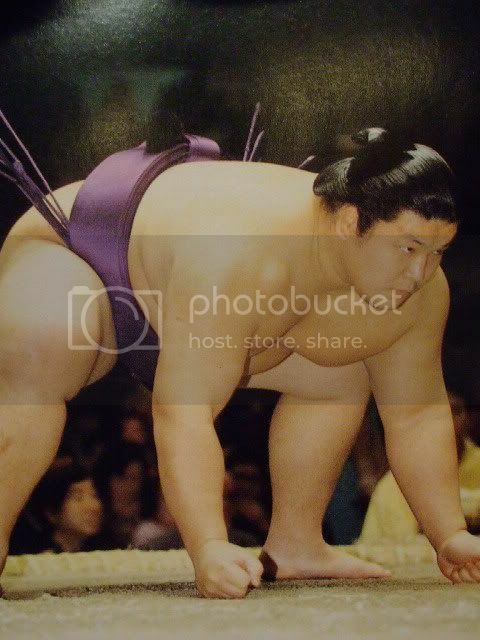 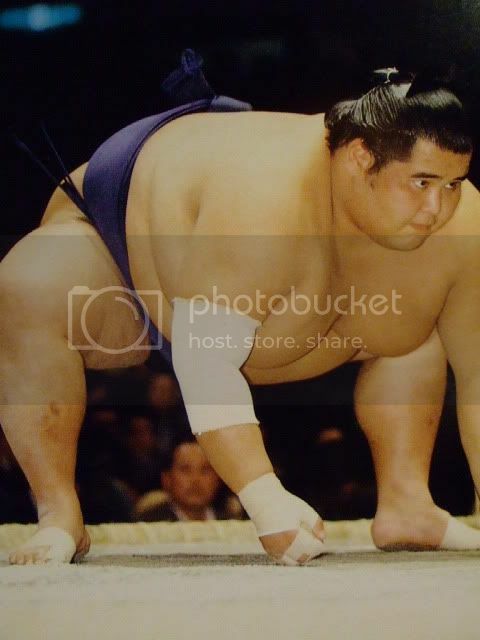 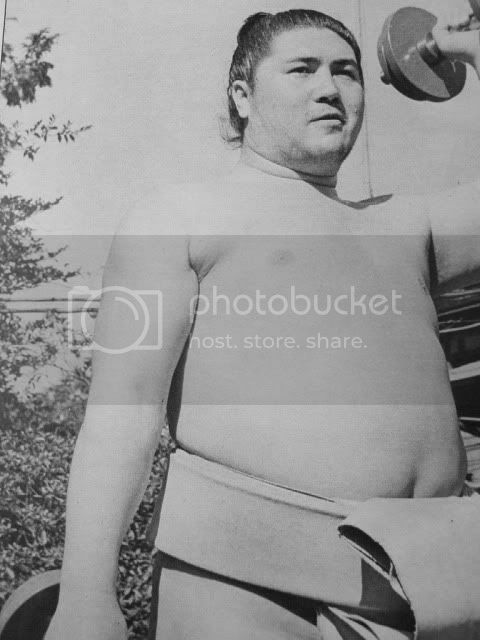 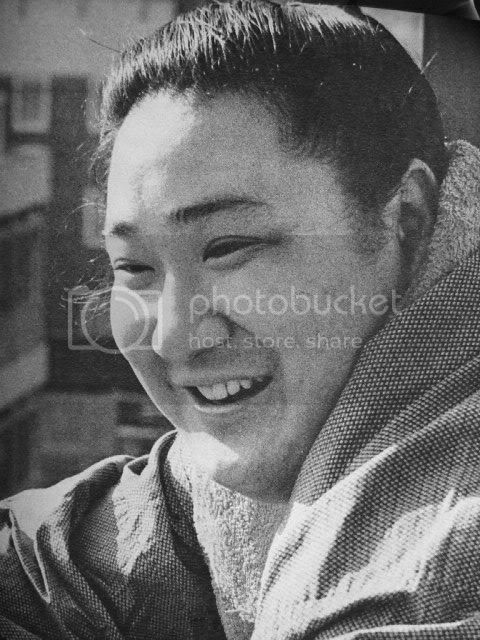 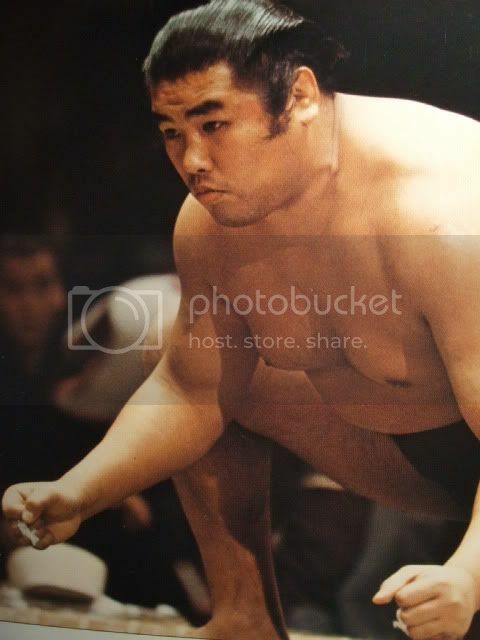 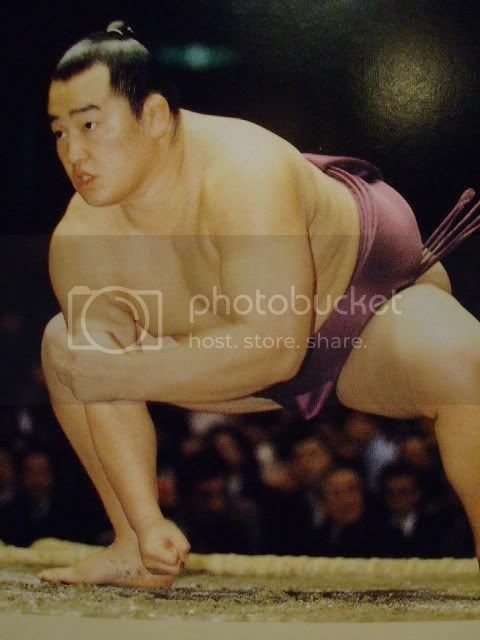 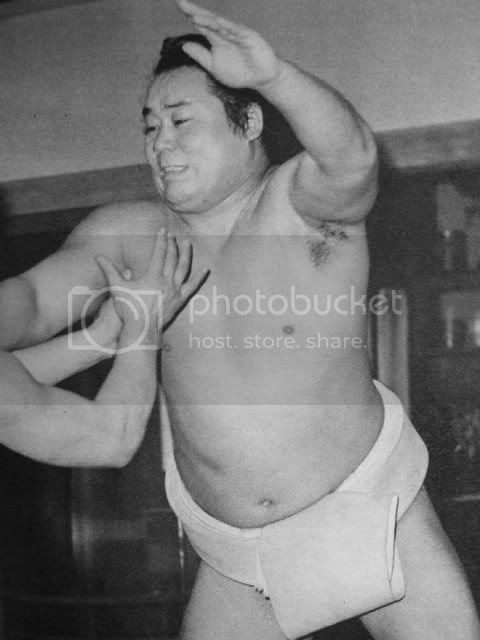 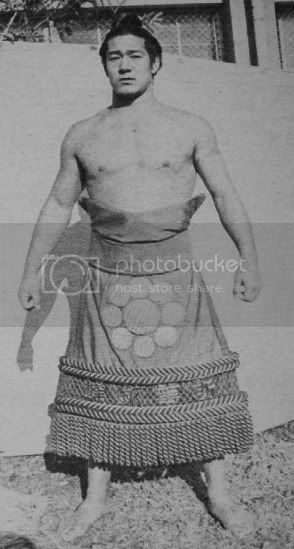 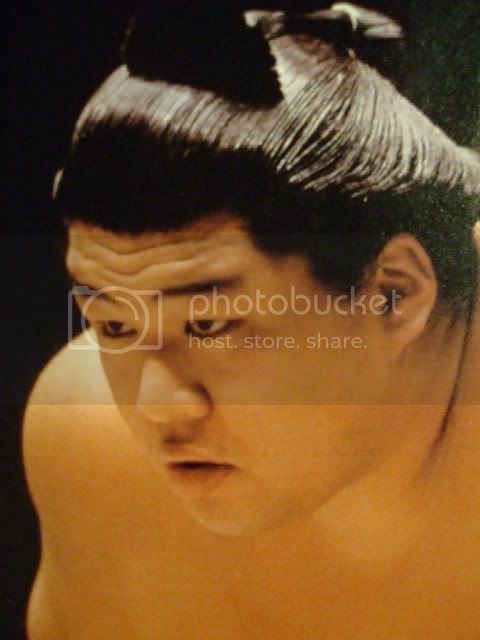 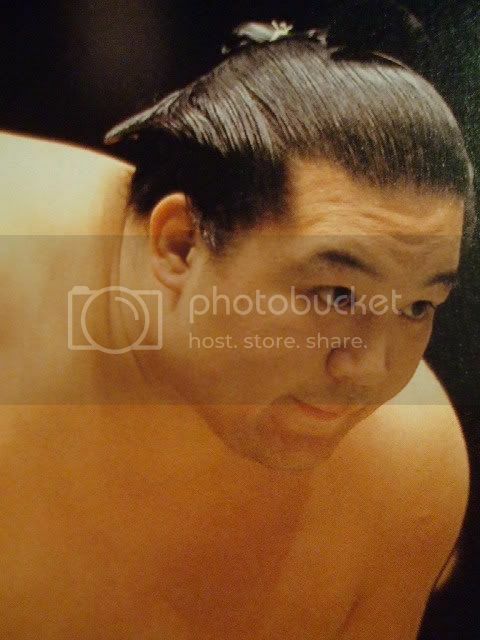 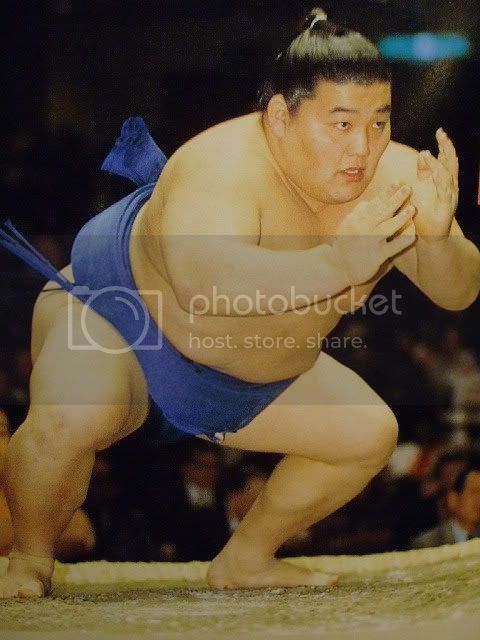 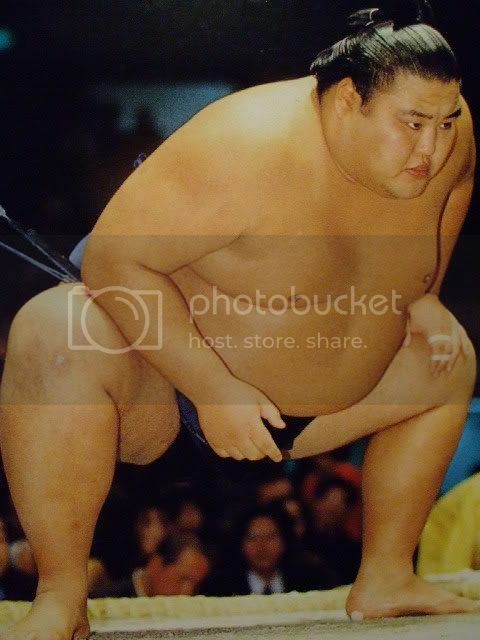 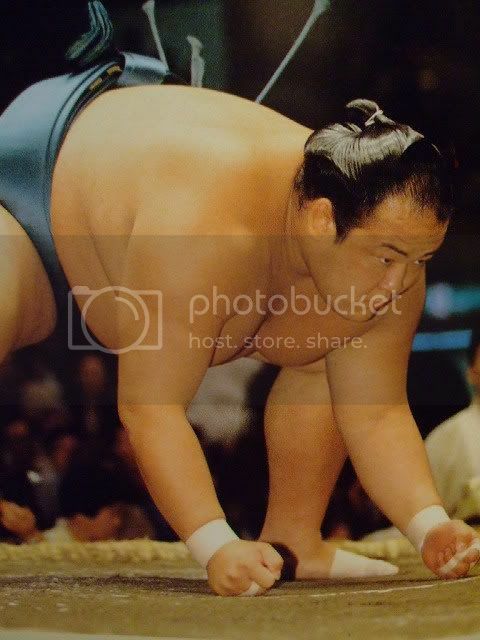 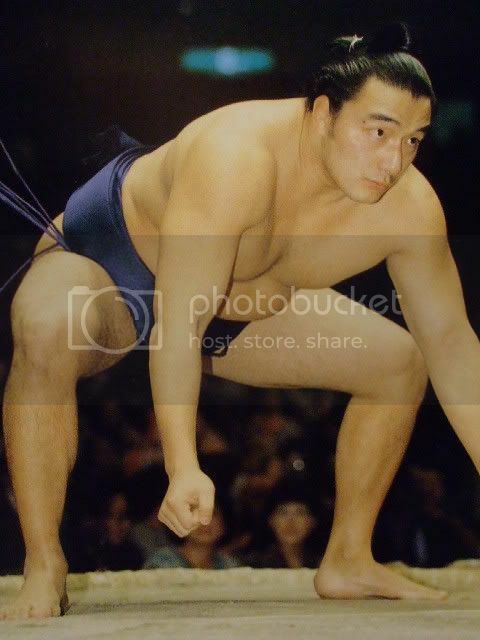 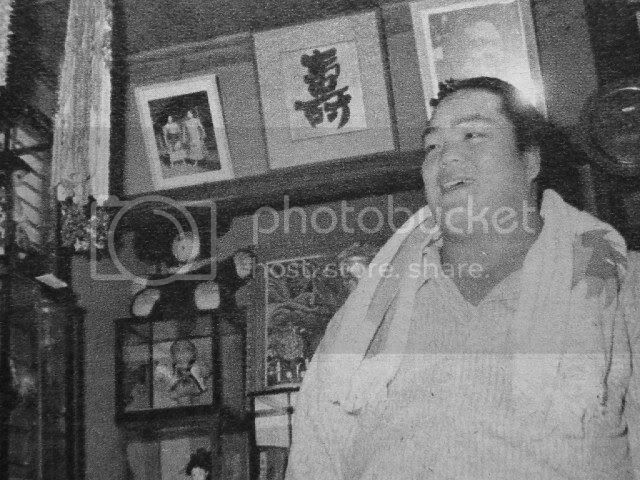 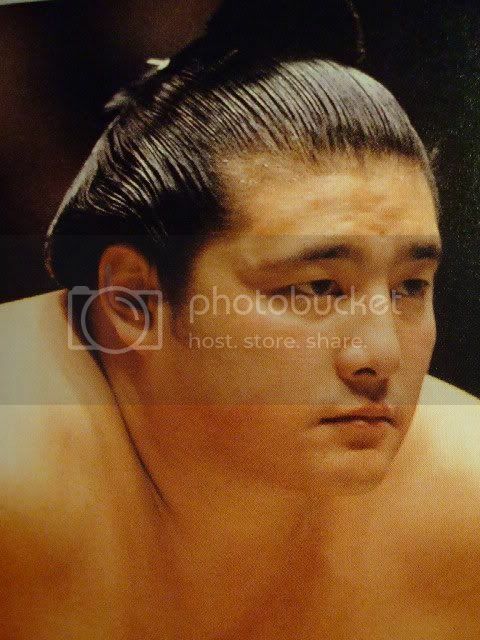 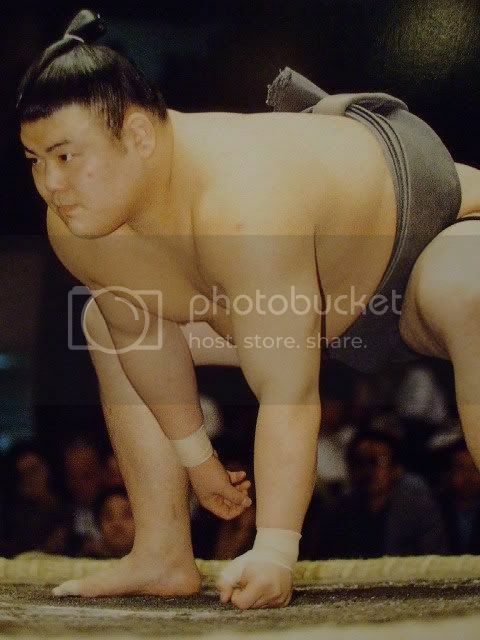 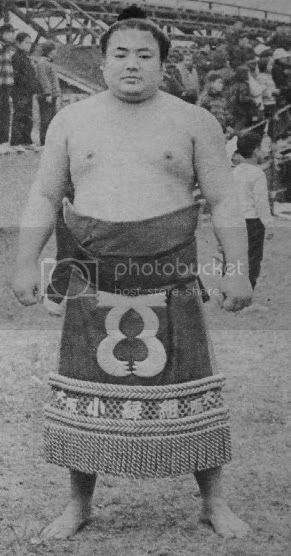 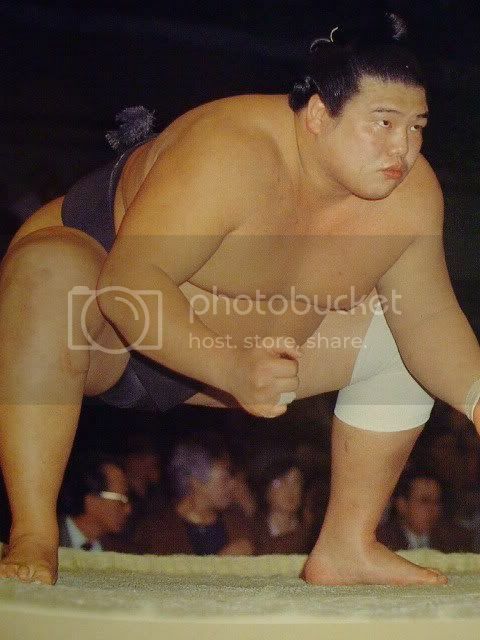 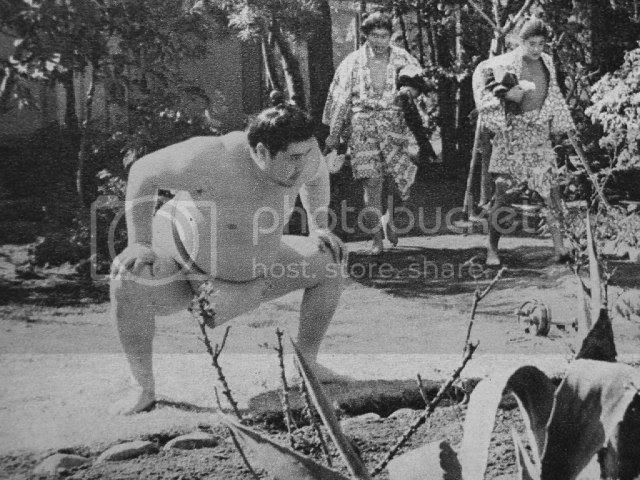 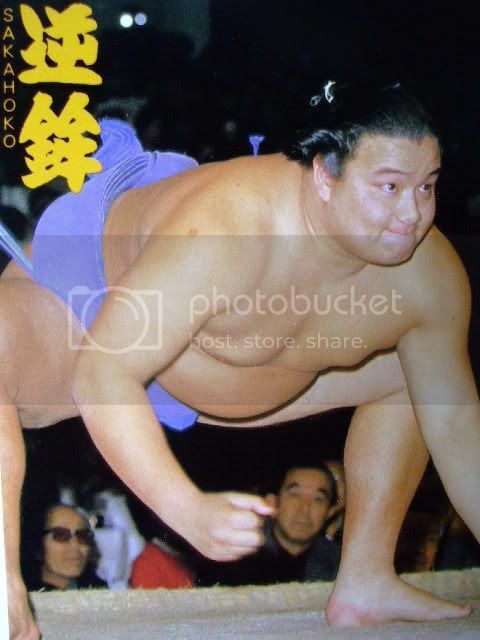 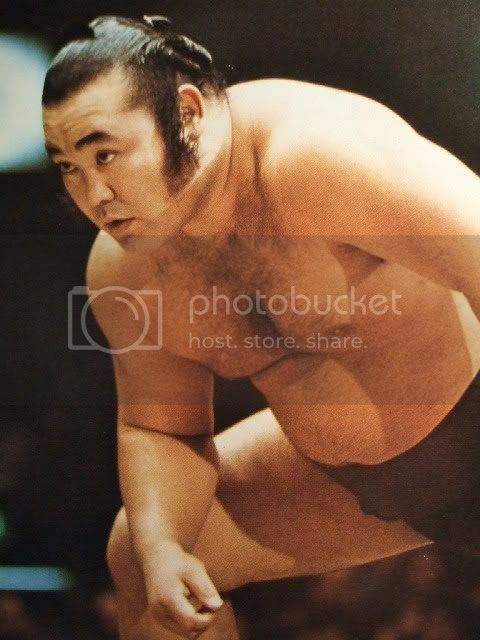 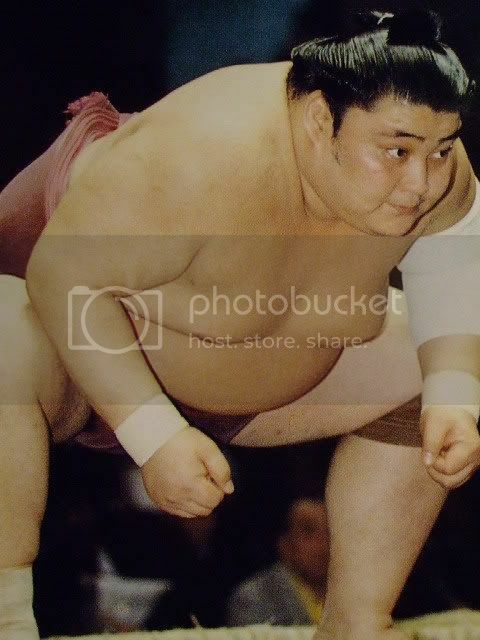 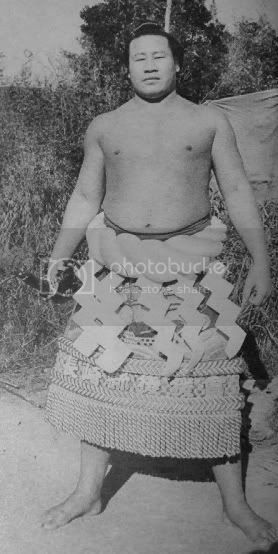 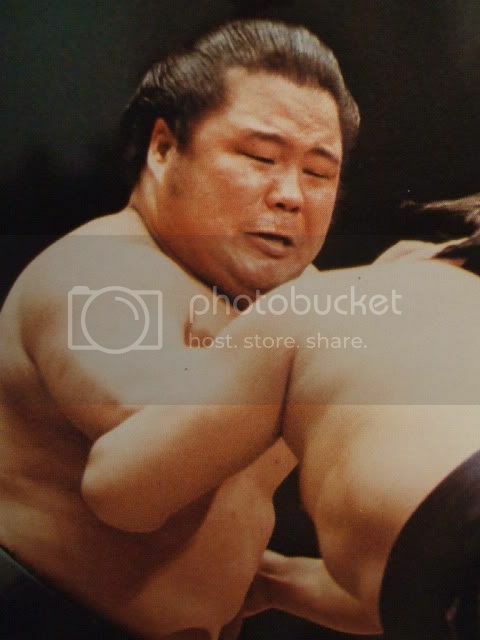 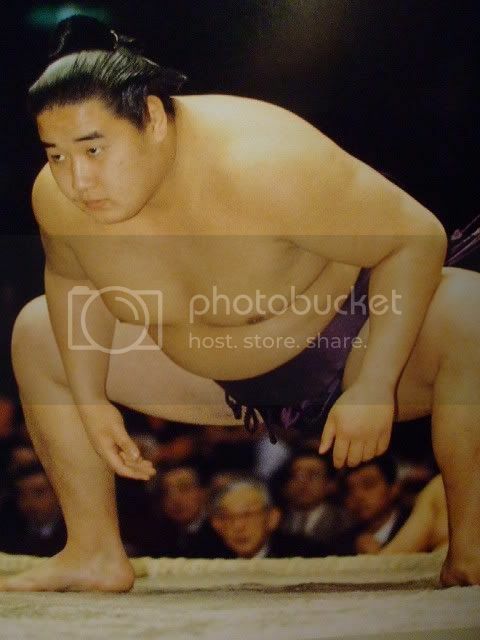 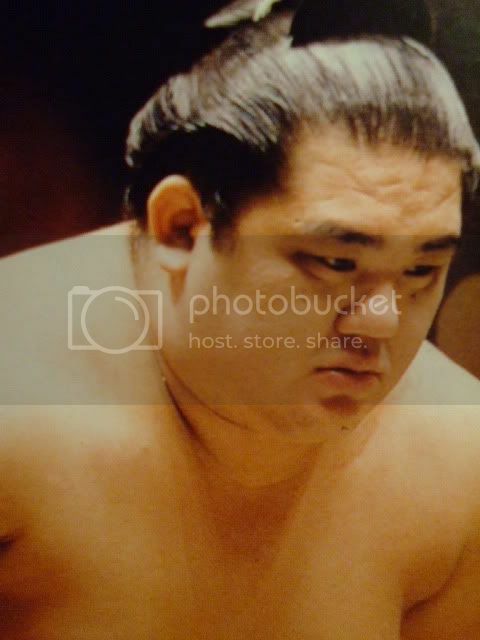 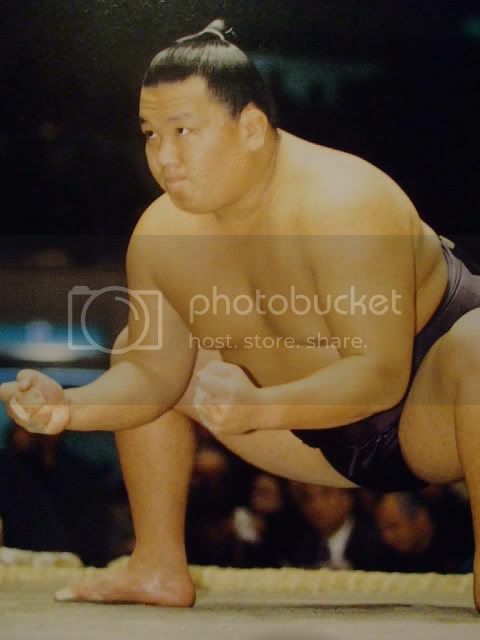 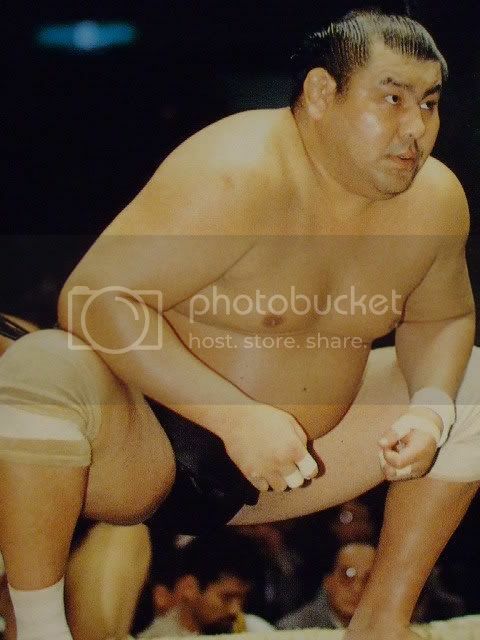 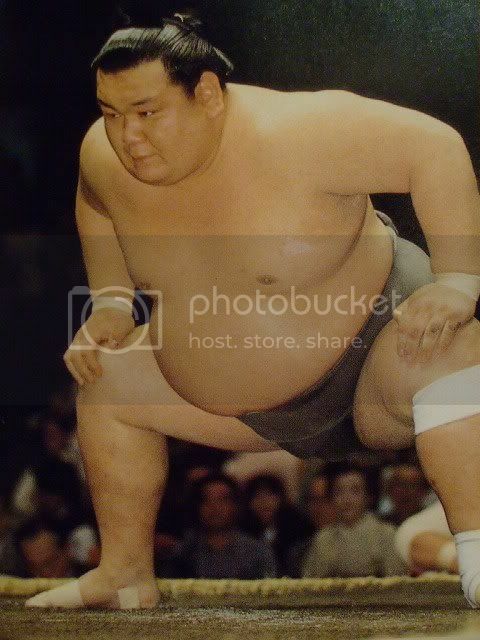 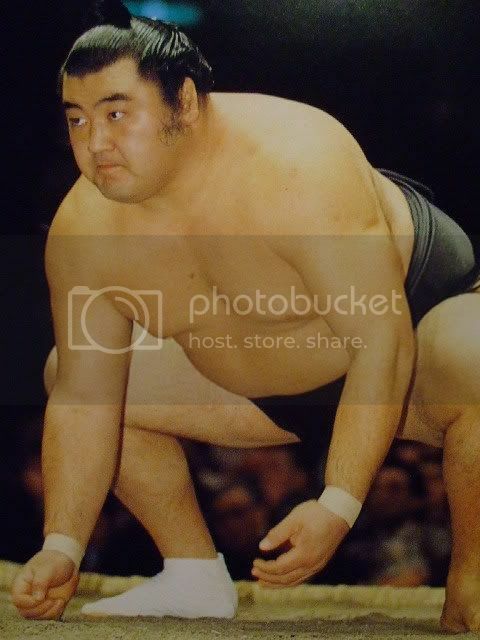 This was Nagoya 1965, his first basho, a 6-1 with a playoff win as five rikishi were 6-1. 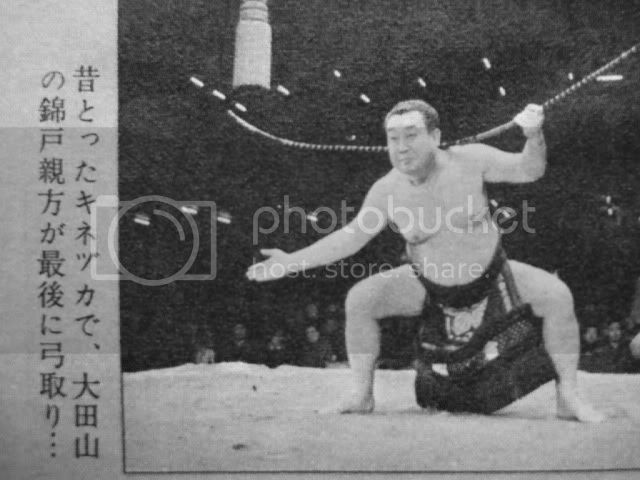 The last bout was against Kawasaki, later makuuchi Nishikinada/Taiga (50 basho as sekitori, highest rank M1, sometimes coming only one win short of sanyaku promotion). 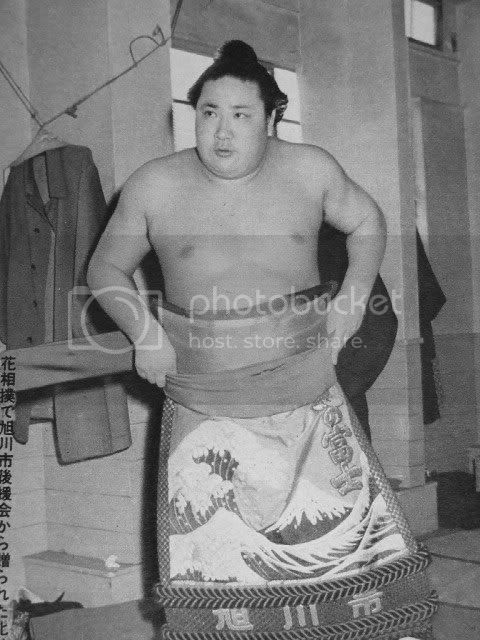 The other four yusho winners are Mizunagare(? 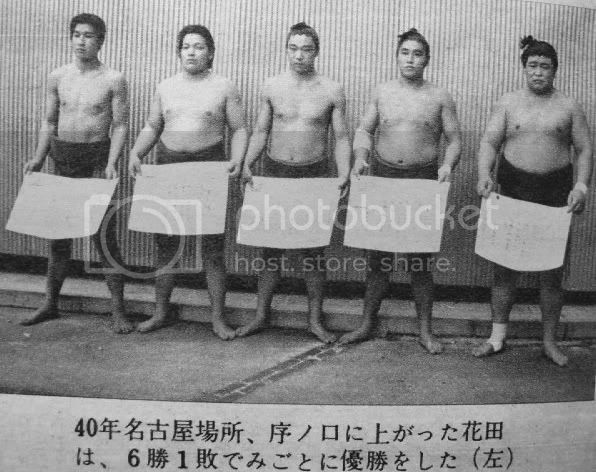 ), Tsuzuki, Kotonoumi (those three never were sekitori) and Amatsukaze (second juryo yusho, beating Hirokawa in a playoff). 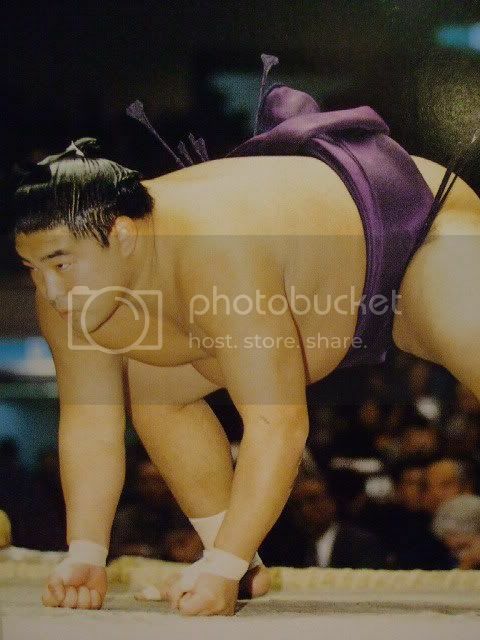 ok a few more just before i get to work. 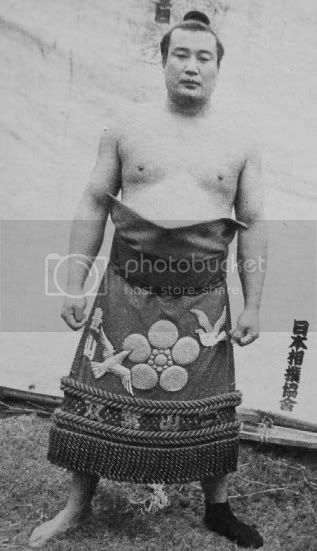 Daizyu is more often Romanized Daiju, I think. 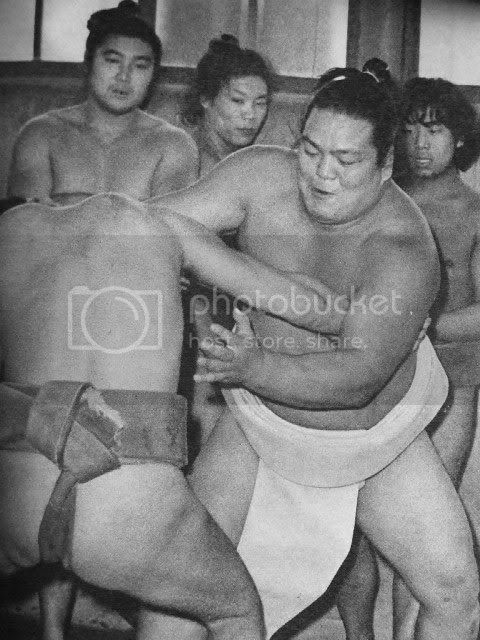 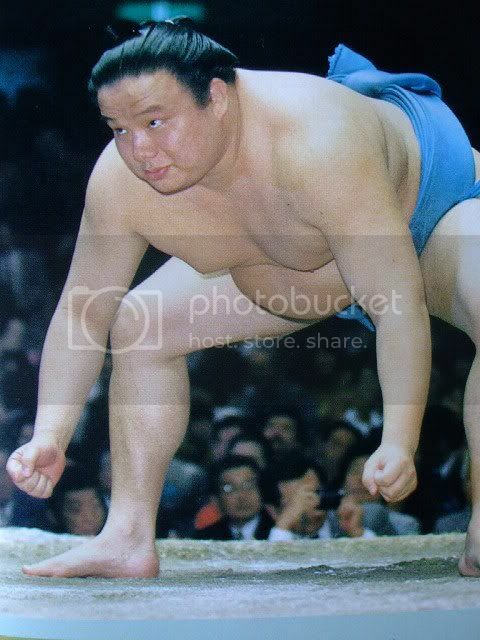 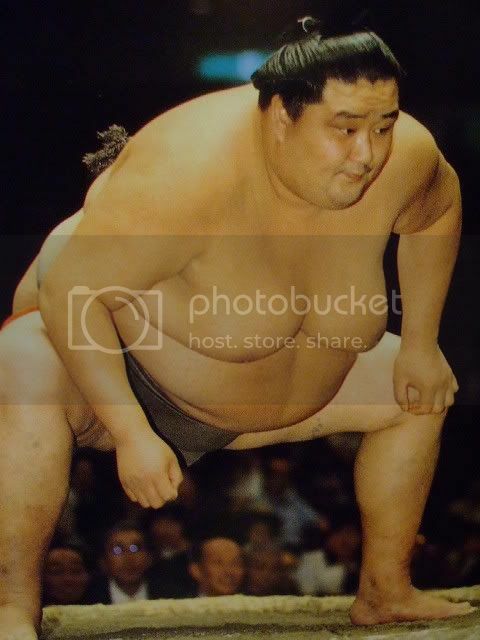 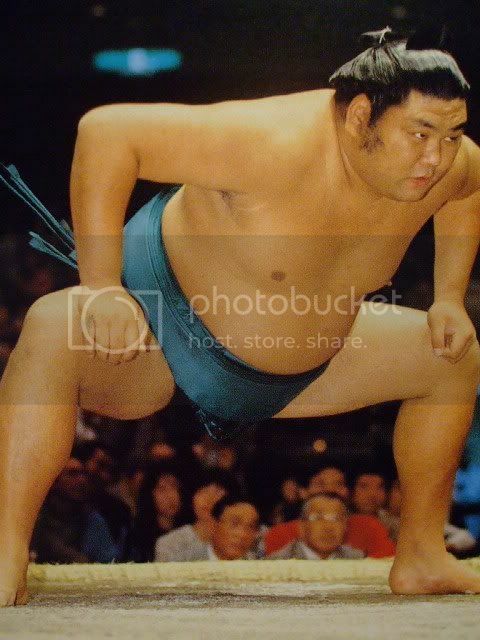 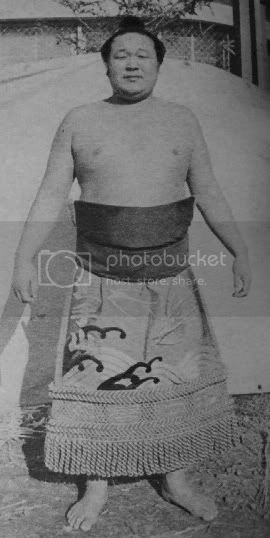 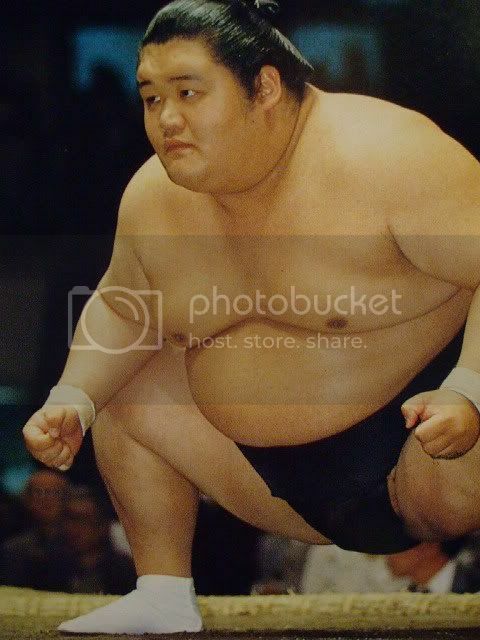 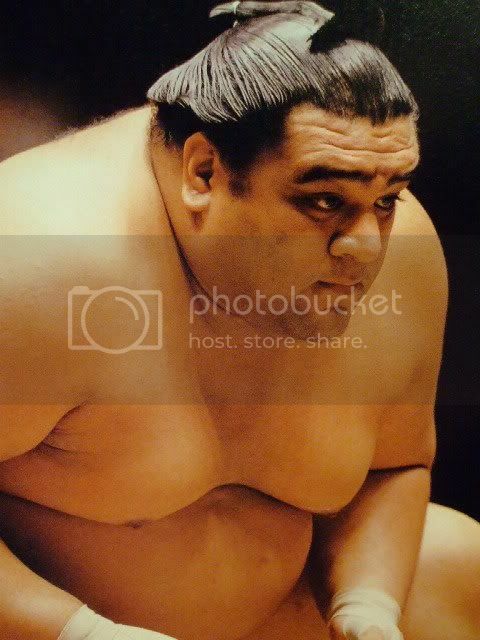 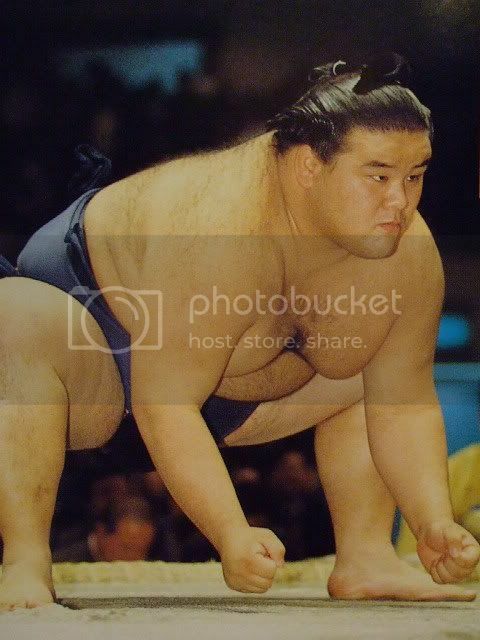 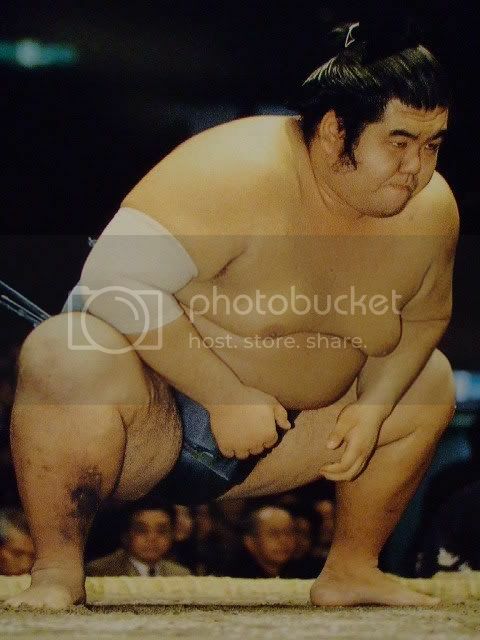 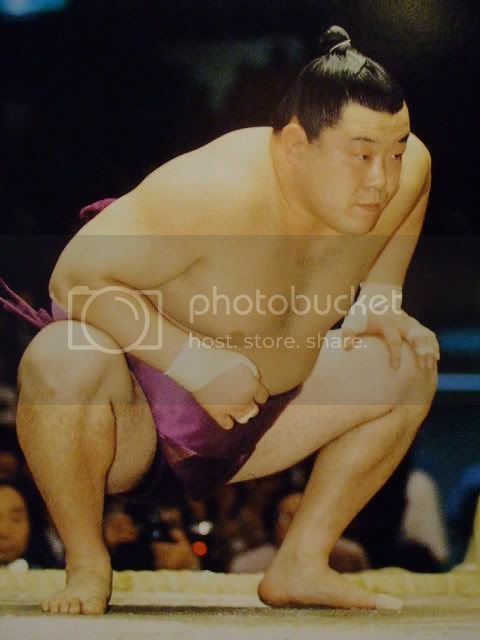 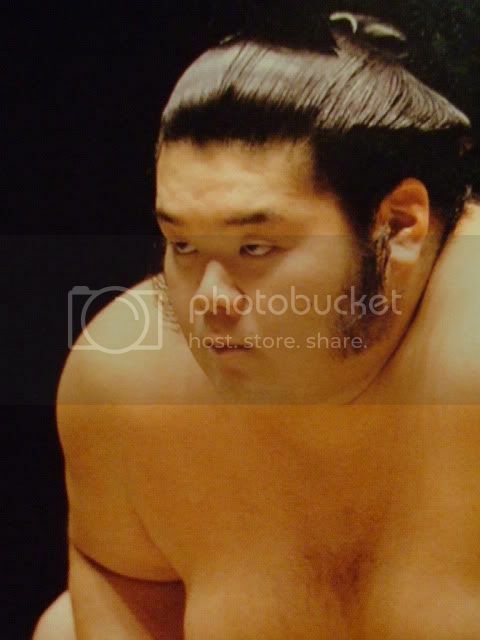 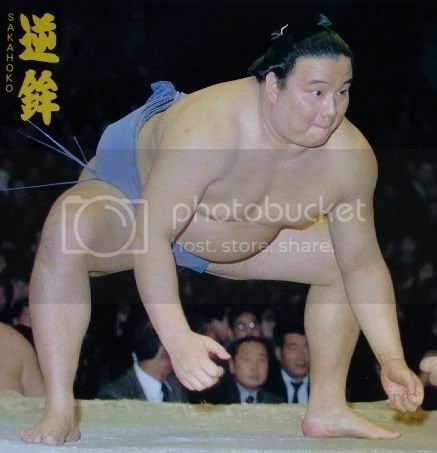 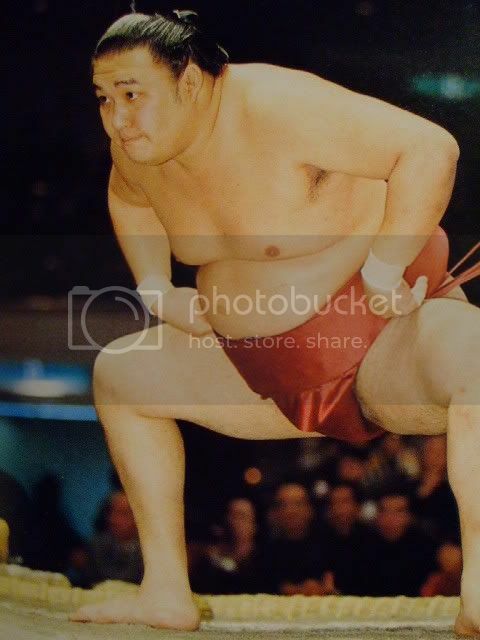 The ozeki who succumbed to juryo. 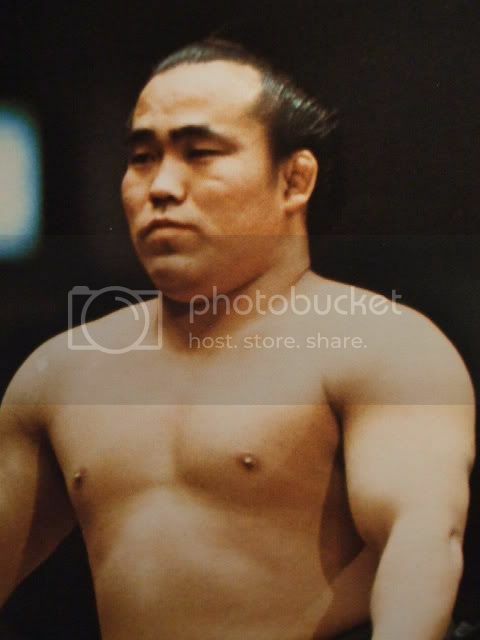 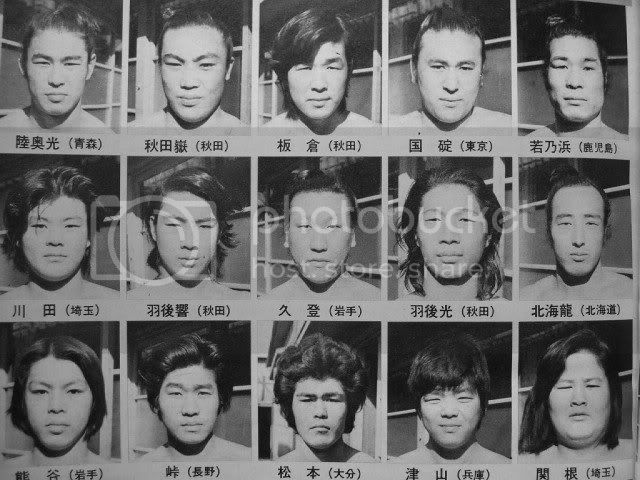 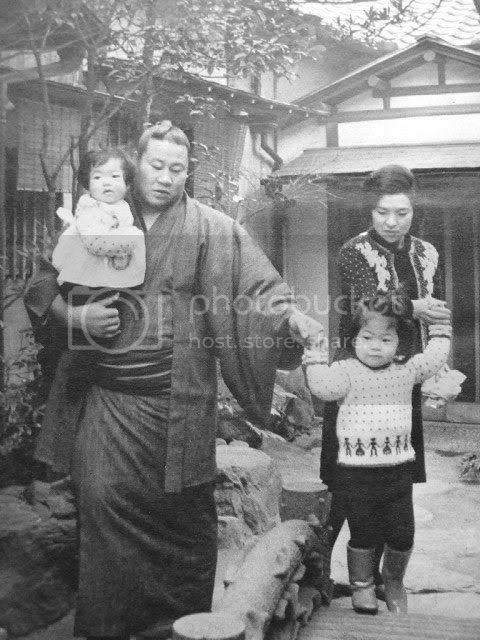 Masuiyama is naturally version 2.0 as his father was Masuiyama, too. 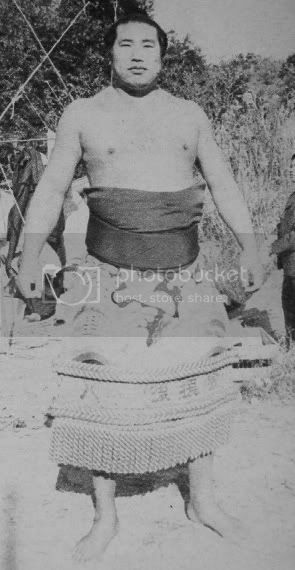 First father & son pair to reach ozeki. 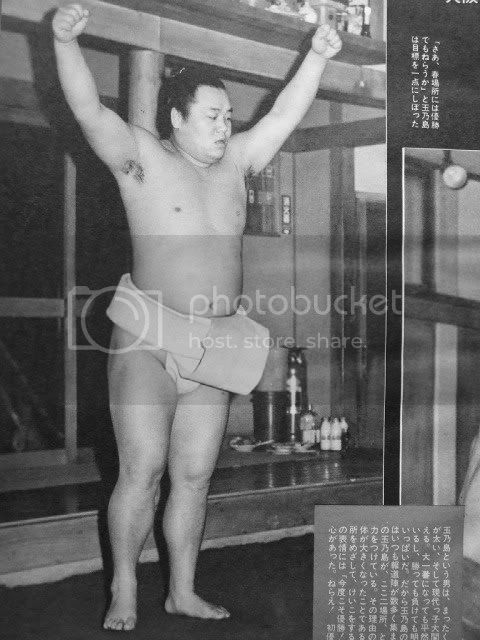 I think M2 has made a record as well? 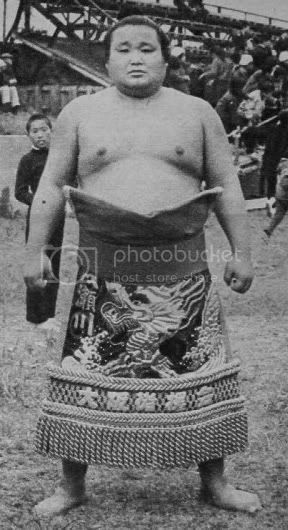 Daizyu is more often Romanized Daiju, I think. 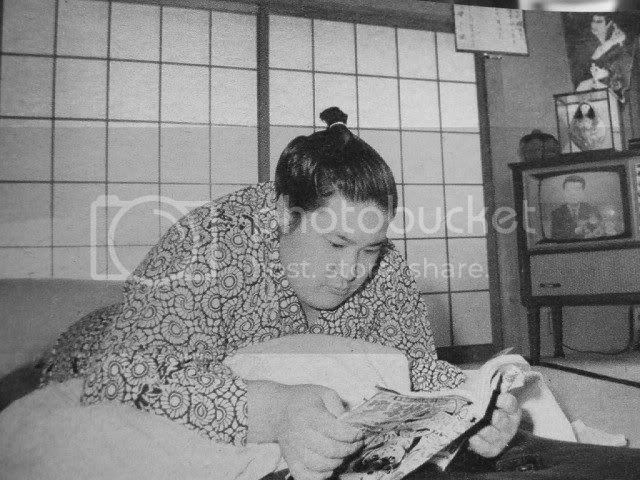 that's what i thought myself but i preferred to write whatever was actually printed in the magazine.